1. Slice your chicken and add to a bowl with the rest of the Turmeric Chicken ingredients, season and mix wel,l then place in the fridge. 2. Now prepare your kale by removing the woody stem of the leaves and roughly chopping or simply ripping the leaves. Wash and drain the leaves and then add some fresh sea salt and scrunch with your hands. This will help soften the leaves. Also put your griddle pan or frying pan on a medium heat. 3. Chop your avocado and squeeze half the lemon onto the kale leaves and add the chopped avocado and scrunch again with your hands. 4.Finish chopping your tomatoes, celery and grate your carrots and add to the bowl with the olive oil. 5.Cook your chicken now for around 3 minutes each side until cooked through and golden. 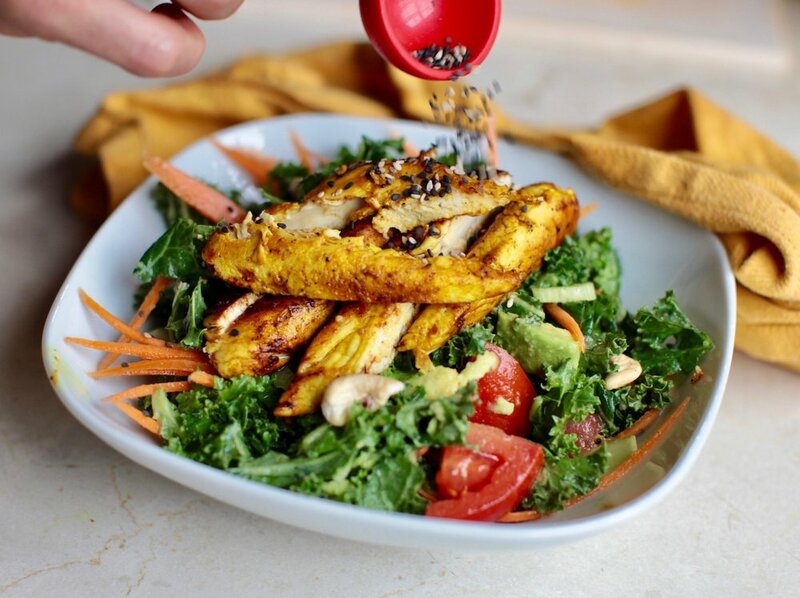 6.Serve up the salad in a bowl or plate and top with your chicken and some sesame seeds.